My new pair that is coming will be mounted with Head RD16's and Fischer WC Race plates. With the recent snow we received in CO last week (LL got 16") I decided that the slopes were safe enough to take the new skis on their maiden voyage. As I mentioned previously, I decided to go with the Tyrolia Speedplate Plus 13. This is a new plate from Tyrolia that has been out now for 2 seasons, but is unfortunately really hard to get a hold of. The design is quite a bit different than the older Carving Plates. I would say that it's much closer now to the RDX race plate, but includes pre-drilled holes like the Carving Plates. The Speedplate now has 7 sets of usable positions for the toe. Thus if you setup your mount so that you use the middle position you'll have the ability to adjust your mount position further forward by 20mm or further back by 20mm (both directions have two 10mm increments). Interestingly, the plate is 13mm tall right in the middle, but directly under the heel and toe of the boot the plates measures 12mm while out at near the ends of the plate it's about 14.5mm. I decided to write in more detail about the plate I chose because I really think it adds something extra to the ski performance with its ability to provide a free flexing, vibration absorbing platform for your binding mount. Using this plate my stand height ended up at 47mm at the heel and 42mm at the toe (a 5mm delta). The Head/Tyrolia Tech manual shows this binding as having a 7mm delta, but I've never measured a single Head or Tyrolia binding having that much delta. Most of my skis have a delta somewhere between 3-5mm so I felt right at home with this binding and plate setup. As I stated in my earlier post, my calculated mount position put me at 32mm forward of the factory line. 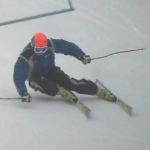 This was also 20mm forward of the position I was able to use when I tested the demo skis. I triple checked my measurements after I tuned the skis and everything was still spot on for a 32mm forward mount position. Since I mentioned tuning the skis I should say that the skis had fairly consistent geometry in their base and edge work straight out of the wrapper. The bases were dead flat, but the base edge bevel bounced between 0.5mm to 1mm with most of the skis at 0.5mm. I like a 0.5mm base bevel on ~65mm waist skis, but that's not what I wanted on a ski that's 77mm. I reset the edge geometry to a consistent 3* side and 1* base bevel and kept them sharp tip to tail. I also skyvered away the flange above the edges. This exposes the edges so that they can bite into ice better. On the early morning ice the Hart Pulse did not disappoint. They have endless edge grip and are fairly strong torsionally. I felt that I could totally trust the edges from my first turn. However what really surprised me was that the tails of the skis felt much more compliant than the demo pair. 20mm further forward may not sound like much, but for me this difference really transformed the skis. As the morning progressed I felt like the sweet spot on these skis just grew larger. It seemed like I almost couldn't find a bad position where the ski edges would no longer hold. On the demos I needed much more speed to really work the skis, not so with my own setup. The tail didn't own me and the skis felt much quicker to initiate turns while I was able to get much more power into the skis at slower speeds. I could actually bend them under 20 mph! They weren't as damp and stable feeling as the Head Chip 78, but there are times when the Chip 78 can feel a bit like a battleship as they're not always responsive to skier input. The Pulse gives up a little in that area, but gains the feeling of being more nimble and fun to drive. I've found that it can be tough for some skis to equally handle different turn shapes (brushed round carves, edge-locked GS carves, short swing SL turns), but the Pulse was fairly adept at all of them. The only thought I had as I was skiing some steeper terrain with a lot of softening chop was that I could have used a bit more length (the 176cm perhaps), but I think I would have that same feeling with any ski 170cm or less in dealing with those kinds of conditions. On my last run of the day the snow was really starting to soften to the point of slush on the lower mountain. On the upper mountain it depended on what aspect you were skiing, but it was still a crap shoot trying to guess what was coming next. Coming down a fairly easy and wide open green at the top of the mountain I was laying over some high edge angle carves when near the end of the pitch, when I had a good amount of speed and angles, my stance ski dug into the snow more than I was expecting and I completed my binding check (I released at the toe). 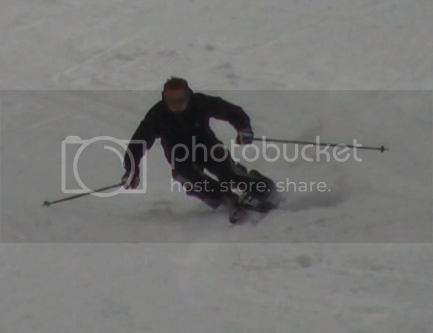 I flew through the air about 20-30' and landed on my left shoulder and back with the other ski still hanging on. This was the biggest fall I've had since I was injured 5 years ago. Luckily I was able to retrieve my ski and get to the bottom of the mountain without an injury. I wasn't sure if anything was wrong so I decided to call it a day. Too bad I didn't get any video of the fall because I'd love to see what it looked like. It sure was a "heluva" release. In retrospect I remember really starting to get nice rebound out of the skis (with weightless float in the transitions) and working to stay on top of them. Maybe I got a bit too aggressive in my re-centering foot pull backs or something. Clearly I did something very wrong for the snow conditions I encountered. Anyhow, as I expected the Hart Pulse is even better with my mount position and my tune. I can't wait to get more time on these skis, but it looks like it may be next season before that happens. I'd really like to get more time on them in off-piste terrain and moguls to really complete my assessment, but for now I'm resting easy with my investment in these skis. Considering I didn't really need them I'm extremely happy that I pulled the trigger on a pair. If you can find a pair at a reasonable price I wouldn't hesitate to give them a buy recommendation. If this is the new Hart then they're clearly doing something right. Nice review and I'm glad your last fall did not ruin your summer. For the past few seasons, my last day was known in advance, so, I always dialed back my intensity to assure golf/biking season was not ruined. Phil found a pair of green Free Flex bindings that will be great color match for the Hart's. We've been discussing where they will be mounted. As there is no rush for delivery (Thanksgiving would be ok), I may see if I can score the new Tyrolia Speedplate 13 plus that you used. If you come across a site that has them, let me know. If anyone else has a source, let me know. I grabbed some shots of the new skis next to the Head Chip 78. Took these in my garage right after I finished mounting them. Jim - The Hart Pulse skis are 170cm while the Head Chip 78 skis are 171cm. This fact can account for some of the difference you're seeing, but also keep in mind that I use Center of Effective Edge in my calculation - not Center of Running Length or Center of Base Length. By using the Effective Edge (EE), the calculation works better no matter what kind of "interesting" tip or tail design may be employed. 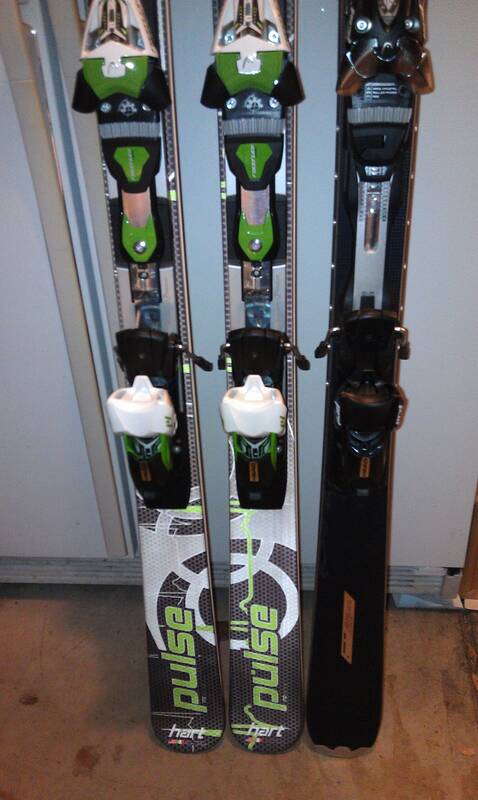 So in the pictures I posted the skis are aligned by the end of their tails (standing up on the floor). If you truly want to compare binding positions between skis, it is necessary to line up their Center of Effective Edge marks. 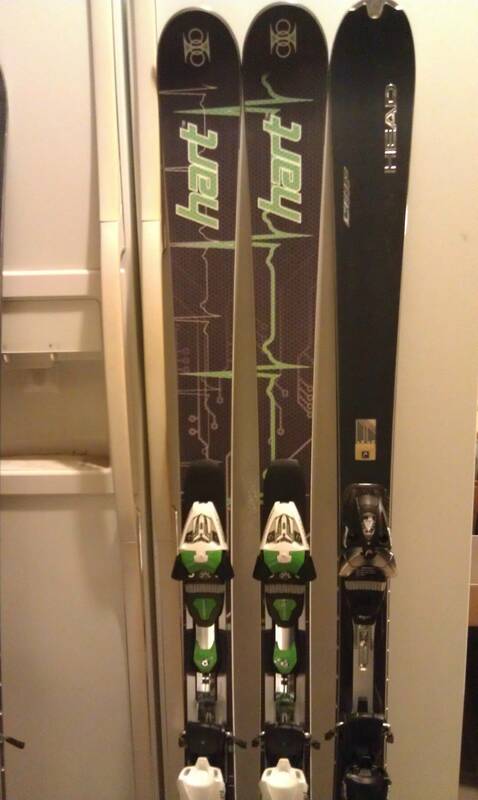 I actually own two pairs of Head Chip 78 skis. I have a 171cm with a mount point at +25mm from the factory mark and a 177cm with a mount point of +32mm. I don't have much experience with Hart so I can't comment on where their factory marks generally land across their ski models. However, I do have enough experience with the Head line-up to say that Head skis are almost universally marked rearward of where I think most accomplished skiers would prefer to be mounted with their skis. This is quite common across Austrian/German manufacturers whereas the French skis are typically more forward with their factory mounts. Elan was also notoriously much further forward, but I haven't been purchasing any Elans in the last couple years so I'm not sure if that still is true. Just catching up with this thread now... sorry guys! Glad you're all on Blossom skis though. Love it! 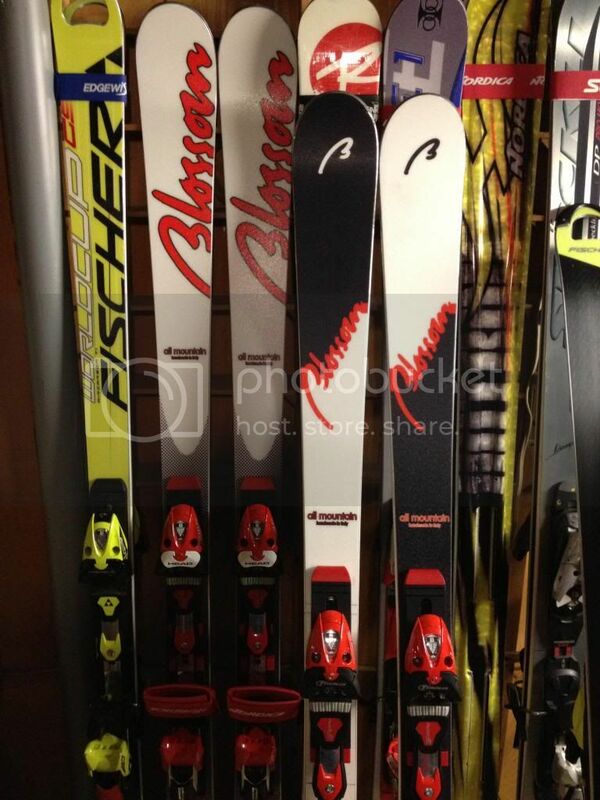 I just picked up another pair of Blossoms (may have **** the core of the other pair on the last run of last season, see below, skis have a new flex pattern...) - the Windshear - same ski as the Pulse, but not green... red, black, and white... so it is cooler. Anyway, I had to mount them so, I figured I'd share my mounting point. Against the manufacturer's mid-sole I am +15mm, same as my other pair. I ski in a child's sized boot (24), so not sure how this translates to real people when you calculate the BoF point. I'm also on the largest size, which is a 180. Perfect ski IMO. After putting in another 4 days on the Pulse on everything from icy groomers to soft chop and small moguls I can provide some additional comparison info against my other skis. I have found that the Pulse is still probably one of the more "ballsy" skis I've ever owned. It's unflappable almost to a fault - it makes me push things to a higher level that I wouldn't try with some of my other skis. A 170cm ski without any metal shouldn't be as smooth and silky feeling on the snow as the Pulse is. However, in comparison to the Head Chip 78, Stockli Rotor 76, or Scott Neo, I find the Pulse to be a much more demanding ski. Skis that strongly reward good movements and correct input also can be the same skis that punish poor movements and mistakes. I've found that I need to be much more on top of the Pulse and maintain that higher degree of focus at all times. I'm thinking that it's really not an intermediate-friendly ski. I find this trait really peculiar due to my observations when hand flexing the ski and looking at its construction I would have been hard pressed to say that it skis the way it actually does. This of course supports the "demo, demo, demo" mantra. I'm interested in seeing what LivingProof's thoughts are on his pair. Friday, if all goes well, will my debut of the Pulses on my, and formerly your, home mountain. I got Day 1 of this season in today and wanted to be on my trusty Supershapes to get the rust out of my technique. Presently, the Pulse binding center is 20 mm forward of the marked center position. As we both have 170's, could you please measure your calculated marking point from the rear of the ski. The reason I ask is that only one of my skis has center mark, strange! It does make a mere pedestrian skier, such as myself, wonder a little bit when you are having to pay attention. Living Proof: You have 2 skis, wouldn't the center mark be the same on both? Not sure why you can't just measure your other ski? Just a double check. I plan to attempt High Angles methodology of determining the narrowest point of a ski, and, as we have the exact same ski, another objective data point is of interest. Only High Angles would base his methodology around a digital micrometer. I'm impressed by my fellow engineer need for high tech gear. I did my first day on the Hart Pulse 170 today. Conditions were typical of east coast groomer skiing, some decent, some scratchy, some pushed around granular piles. We still do not have any of the more demanding trails open, so skiing was limited to Blue type trails. After putting in another 4 days on the Pulse on everything from icy groomers to soft chop and small moguls I can provide some additional comparison info against my other skis. I have found that the Pulse is still probably one of the more "ballsy" skis I've ever owned. It's unflappable almost to a fault - it makes me push things to a higher level that I wouldn't try with some of my other skis. A 170cm ski without any metal shouldn't be as smooth and silky feeling on the snow as the Pulse is. I totally agree with HA assessment of the Pulse. It's a pleasure to ski, very stable and smooth, very comfortable on the body - a great ski to be on all day. I spent some time trying to ski with some buds training for GS. While I can't keep up, the Pulse likes speed. Clearly, it's not a Supershape type SL turn radius, but, I easily got it to tighten the turn radius with tipping movements. However, in comparison to the Head Chip 78, Stockli Rotor 76, or Scott Neo, I find the Pulse to be a much more demanding ski. Skis that strongly reward good movements and correct input also can be the same skis that punish poor movements and mistakes. I've found that I need to be much more on top of the Pulse and maintain that higher degree of focus at all times. I'm thinking that it's really not an intermediate-friendly ski. I find this trait really peculiar due to my observations when hand flexing the ski and looking at its construction I would have been hard pressed to say that it skis the way it actually does. This of course supports the "demo, demo, demo" mantra. I can't concur that the Pulse needs high levels of staying on top of. High Angles pushes the ski much more to the limits than I, gets bigger edges and he as mucho more experience with other skis. I can only compare it to the Supershape I skied 2 days ago and they are somewhat similar to me with respect to staying focused. For sure, I never felt like I had to fight the Pulse, as I often feel when skiing wider skis than this 77. I'm skiing the Pulse shorter than perhaps typical recommendation of 178 for a larger skier. I liked it in Tahoe, liked it in Pa. Philpug did a Starthaus tune on it prior to sending it east, and, it was just a very neutral ski with no bad habits. Phil often states we ski the tune when demoing skis, so the tune may have played a part in my review, but, HA also does his own tuning so I know his skis were prepped. I'm pleased that I bought a "short" ski as I gain a shorter radius without high speed tradeoff. I do agree with HA that the ski responds to good movements. I spent a lot of time working on fore/aft, counter balance and counteracting (Harbites know about what I speak) and the ski did better as I did better. Only 2 days in this season, so I've got a long way to go with technique. Y'all who attend the Holiday Valley event in Feb. will get to see firsthand how it works. Fun fact: My Blossom Windshear has a layer of metal in it... basically the Pulse with metal. My old Hart Pulse (Stage 1) was the version with no metal... same as the Blossom Snoras I think.